SOUTH BRISTOL COMMUNITY HOSPITAL • NATIONAL COMPOSITES CENTRE, EMERSON GREEN BRISTOL HAYESFIELD SCHOOL, BATH • ST OSWALDS RETIREMENT VILLAGE, GLOS • YMCA, BRIDGWATER • HOUSING HANOVER PLACE, DOWNEND BRISTOL • METROPOLITAN ACADEMY, SKANSKA BRIS • ENTERPRISE COLLEGE, SKANSKA • SWINDON LIBRARY, WILMOTT DIXON • WELLS NURSING HOME, COWLIN • KINGSFOREST SCH BRISTOL, KEIR WESTERN • FIRE CONTROL TAUNTON, MIDAS • GLOSCAT GLOS, BOVIS • ROLLS ROYCE FILTON, PEARCE • DEFENCE ACADEMY, COSTAIN. 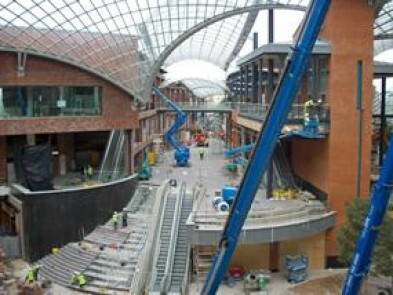 WORK REQUIRED:We were asked to clean this prestigious flagship development, the largest shopping mall in Bristol. We worked closely with Sir Robert McAlpine, providing a team of cleaners at different times during the day and night to ensure the development was opened on time and to budget. We offered a flexible, professional workforce who complied with and were aware of Health and Safety issues involved with this prestigious contract. Cleaning required consisted of cleaning all communal areas, staircases, glass walkway to Car Park, Public Toilets, staff back of house areas. We also were asked undertake specialist cleaning to zinc and copper finishes. Roof cleaning, unblocking drains and gullies. We cleaned all balustrade glass and escalators. We cleaned the high level steel work and glass using IPAF trained operators. We also provided a cleaning service to contractors doing the shop fit outs.